In a world where faith is usually on the defensive, confidence is an essential quality for a theologian. And Eberhard Jüngel has confidence in spades. Indeed, it seems to me that the expression “no apologies” (or “no apologetics”) could serve as the overarching motto for his entire theological program. Whereas others try to ground Christian theology in philosophical principles or human nature, Jüngel asserts (again and again) that “God has spoken”—in Christ, on the cross, once and for all. Despite the complexity of his thought, Jüngel is first and foremost a listener to the Word of the gospel as revealed in Scripture, and his theological method is therefore a daring “chasing after” the Word. Unlike others who have contributed to this series, I do not have an interesting story about how I came to love and admire Jüngel. I have never met him, or heard him speak, or taken a class on his theology. But on the recommendation of this blog, I naively requested a copy of God as the Mystery of the World (1977) via inter-library loan. The experience of reading this sprawling masterpiece, so dense and so rich, was both frustrating and exhilarating. I learned quickly that Jüngel does not accommodate himself to the reader; instead, the reader must accommodate himself to Jüngel (again, “no apologies”!). But the theological workout paid sizable dividends, as reading God as the Mystery of the World triggered a seismic shift in my theological perspective. Here I found a thinker whose brilliance was so enormous that his theology could somehow encompass the great minds of the past, both theological and philosophical. Barth and Bultmann, Luther and Aquinas, Hegel and Nietzsche, Descartes and Heidegger—all contribute in different ways to Jüngel’s symphonic theology. Jüngel also has a polemical side—another admirable trait, in my opinion—that was on display during the controversy surrounding the Joint Declaration on the Doctrine of Justification. 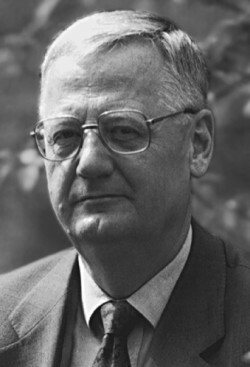 His desire to bring “clarity” to the debate resulted in the book Justification (1999), a masterly presentation of the essence of Lutheran theology. In keeping with the spirit of his entire career, Jüngel declared that Justification “is not a book that takes pleasure in compromise. An ordered theology makes no compromises.” For Jüngel, the gospel needs no apologies.